Down at the lakefront, the frozen water forms into a phenomenon known as ice volcanoes. These smaller volcanoes are 3 to 4 feet tall. 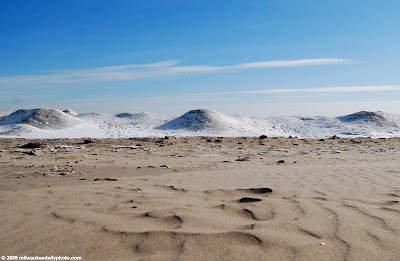 The winds have stripped most of the snow from a wide swatch of beach, leaving the whole thing looking like a scene from another planet. Wow. That's a very interesting phenomenon and something I've never heard of (much less seen!). Thanks!